This is the first of a pair of Libya map reports, with the second spotlighting the retreat of "Islamic State" forces from May to September. 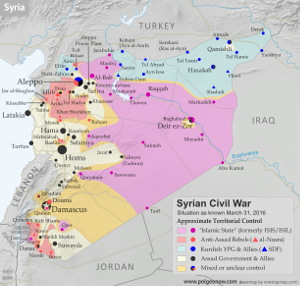 The second report, with a more up-to-date map, is available to members of our conflict map subscription service. Starting soon after our last Libya control map report in March, the structure of Libya's divided control and rival governments underwent a massive realignment, with international recognition essentially switching from one side of the country to the other, and some key fighting forces switching sides as well. Last year, the country was already divided between two rival governments, the controversial General National Congress (GNC) in the capital city of Tripoli and the more internationally-recognized House of Representatives in the eastern city of Tobruk (with forces of the so-called "Islamic State", formerly ISIS/ISIL, holding territory in between). In an effort to unite the two governments, a UN-backed peace deal created a new "Government of National Accord" (GNA), which last March dramatically sailed into Tripoli from Tunisia to take over the reigns. Within a few weeks, the old GNC government had yielded to GNA authority, and most of the GNC-associated Libya Dawn militias agreed to support the new government too (at least for the time being). However, the GNA failed to secure an endorsement from the legislature in Tobruk, limiting the new government's power in the east to support from the maverick Petroleum Facilities Guard (PFG) along the central coast. The result is that most international recognition has shifted to the new Tripoli government, whose military is largely made up of the same forces that were loyal to the controversial GNC, while Tobruk's formerly recognized government and army are now the defiant rivals. For the full history of the current civil war since the fall of dictator Muammar Gaddafi in 2011, including the origins of the country's competing governments, see our detailed Libya background article and timeline from August 2015. 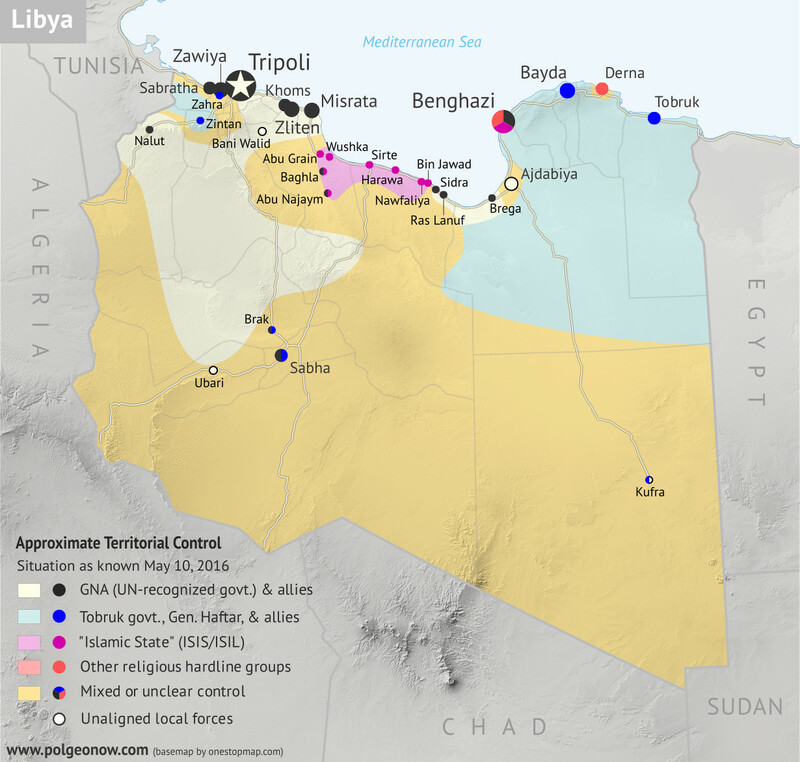 The following is a detailed timeline of major political events and changes to territorial control since our previous Libya control map of March 2016. The European Union agreed on sanctions against three Libyan officials - including the president of the Tripoli-based General National Congress (GNC) - who were opposed to the new UN-backed unity government, the Government of National Accord (GNA). The designated prime minister of the GNA said he expected to move to Tripoli from the neighboring country of Tunisia within days. The dissolution of the GNC government started, with its officials, under pressure from former allies, leaving Tripoli and going back to their home cities. Members of the Presidential Council of the GNA sailed into Tripoli the same day. Subsequently, 10 cities formerly under the control of the GNC pledged their support for the GNA. Following this, GNA support continued to spread further in the west and south of the country, while in the east support for the GNA remained uncertain. However, the Petroleum Facilities Guard (PFG) under Ibrahim Jathran, in control of eastern oil ports including Sidra, Ras Lanuf, and Brega, did pledge its allegiance to the GNA. The GNC-affiliated "National Salvation Government" in Tripoli disbanded and ceded authority to the Presidential Council. The next day, the State Supreme Council elected its president and first deputy. By this time, GNA Prime Minister Fayez al-Serraj was in control of Libya's central bank and national oil company as well. The Tobruk-loyal "Libyan National Army" (LNA) organization captured the University of Benghazi, the Al-Hawari cement factory and two nearby cemeteries from religious hardline militias in Benghazi, as well as the Al-Quwarsha area of Benghazi's district. Forces of the so-called "Islamic State" (IS, formerly ISIS/ISIL) withdrew from positions on the outskirts of Derna, cementing the control of the Mujahideen Shura Council (MSC), a rival religious hardline group, over the town. The LNA also claimed to have taken control of IS’s abandoned positions. IS ambushed a convoy reportedly consisting of GNA fighters and British and Italian soldiers. The attack reportedly left some Italian marines dead or wounded. As of the end of April, the Tobruk-based House of Representatives, the previous internationally-recognised Libyan parliament, had not yet given its support to the new GNA government in Tripoli. Major sticking points were Tripoli's disdain for LNA star general Khalifa Haftar, as well as a procedural requirement for the GNA government to present itself in person before the House (meanwhile, GNA leaders were still holed up in an old navy base in Tripoli despite the proclaimed support of many militias in the city). Also by late April, the GNA had gained the loyalty of several important government ministries. As GNA forces were preparing an offensive to recapture Sirte from IS forces, IS launched a pre-emptive attack. In the offensive, IS claimed to have captured several villages, including Abu Grain, Baghla, and Abu Najaym. A military faction in the eastern city of Ajdabiya declared that it did not support the Tobruk-based LNA. Graphic of the Libyan flag is in the public domain (source).